For the season point system, see Road to the Kentucky Derby. For the 2018 race, see 2018 Kentucky Derby. The Kentucky Derby /ˈdɜːrbi/ is a horse race that is held annually in Louisville, Kentucky, United States, on the first Saturday in May, capping the two-week-long Kentucky Derby Festival. The race is a Grade I stakes race for three-year-old Thoroughbreds at a distance of one and a quarter miles (2.0 km) at Churchill Downs. Colts and geldings carry 126 pounds (57 kilograms) and fillies 121 pounds (55 kilograms). The race is often called "The Run for the Roses" on account of the blanket of roses draped over the winner. It is also known in the United States as "The Most Exciting Two Minutes In Sports" or "The Fastest Two Minutes in Sports" in reference to its approximate duration. It is the first leg of the American Triple Crown and is followed by the Preakness Stakes, then the Belmont Stakes. Unlike the Preakness and Belmont Stakes, which took hiatuses in 1891–1893 and 1911–1912, respectively, the Kentucky Derby has been run every consecutive year since 1875. The Derby, Preakness, and Belmont all were run even every year throughout the Great Depression and both World Wars (when the Olympics and nearly all professional sports seasons were canceled). A horse must win all three races to win the Triple Crown. In the 2015 listing of the International Federation of Horseracing Authorities (IFHA), the Kentucky Derby tied with the Whitney Handicap as the top Grade 1 race in the United States outside the Breeders' Cup races. In 1872, Col. Meriwether Lewis Clark, Jr., grandson of William Clark of the Lewis and Clark expedition, traveled to England, visiting Epsom in Surrey where The Derby had been running annually since 1780. From there, Clark went on to Paris, France, where in 1863, a group of racing enthusiasts had formed the French Jockey Club and had organized the Grand Prix de Paris at Longchamp, which at the time was the greatest race in France. The Kentucky Derby was first run at 1 1/2 miles (12 furlongs; 2.4 km) the same distance as the Epsom Derby. The distance was changed in 1896 to its current 1 1/4 miles (10 furlongs; 2 km). On May 17, 1875, in front of an estimated crowd of 10,000 people, a field of 15 three-year-old horses contested the first Derby. Under jockey Oliver Lewis, a colt named Aristides, who was trained by future Hall of Famer Ansel Williamson, won the inaugural Derby. Later that year, Lewis rode Aristides to a second-place finish in the Belmont Stakes. Although the first race meeting proved a success, the track ran into financial difficulties and in 1894 the New Louisville Jockey Club was incorporated with new capitalization and improved facilities. Despite this, the business floundered until 1902 when Col. Matt Winn of Louisville put together a syndicate of businessmen to acquire the facility. Under Winn, Churchill Downs prospered and the Kentucky Derby then became the preeminent stakes race for three-year-old thoroughbred horses in North America. Thoroughbred owners began sending their successful Derby horses to compete later in the Preakness Stakes at the Pimlico Race Course, in Baltimore, Maryland, followed by the Belmont Stakes in Elmont, New York. The three races offered large purses and in 1919 Sir Barton became the first horse to win all three races. However, the term Triple Crown didn't come into use for another eleven years. In 1930, when Gallant Fox became the second horse to win all three races, sportswriter Charles Hatton brought the phrase into American usage. Fueled by the media, public interest in the possibility of a "superhorse" that could win the Triple Crown began in the weeks leading up to the Derby. Two years after the term was coined, the race, which had been run in mid-May since inception, was changed to the first Saturday in May to allow for a specific schedule for the Triple Crown races. Since 1931, the order of Triple Crown races has been the Kentucky Derby first, followed by the Preakness Stakes and then the Belmont Stakes. Prior to 1931, eleven times the Preakness was run before the Derby. On May 12, 1917 and again on May 13, 1922, the Preakness and the Derby were run on the same day. On eleven occasions the Belmont Stakes was run before the Preakness Stakes. On May 16, 1925, the first live radio broadcast of the Kentucky Derby was originated by WHAS and was also carried by WGN in Chicago. On May 7, 1949, the first television coverage of the Kentucky Derby took place, produced by WAVE-TV, the NBC affiliate in Louisville. This coverage was aired live in the Louisville market and sent to NBC as a kinescope newsreel recording for national broadcast. On May 3, 1952, the first national television coverage of the Kentucky Derby took place, aired from then-CBS affiliate WHAS-TV. In 1954, the purse exceeded $100,000 for the first time. In 1968, Dancer's Image became the first (and to this day the only) horse to win the race and then be disqualified after traces of phenylbutazone, an analgesic and anti-inflammatory drug, were found in the horse's urinalysis; Forward Pass won after a protracted legal battle by the owners of Dancer's Image (which they lost). Forward Pass thus became the eighth winner for Calumet Farm. Unexpectedly, the regulations at Kentucky thoroughbred race tracks were changed some years later, allowing horses to run on phenylbutazone. In 1970, Diane Crump became the first female jockey to ride in the Derby, finishing 15th aboard Fathom. The fastest time ever run in the Derby was set in 1973 at 1:59.4 minutes, when Secretariat broke the record set by Northern Dancer in 1964. Not only has Secretariat's record time yet to be topped, in the race itself, he did something unique in Triple Crown races: each successive quarter, his times were faster. Though times for non-winners were not recorded, in 1973 Sham finished second, two and a half lengths behind Secretariat in the same race. Using the thoroughbred racing convention of one length equaling one-fifth of a second to calculate Sham's time, he also finished in under two minutes. Another sub-two-minute finish, only the third, was set in 2001 by Monarchos at 1:59.97. The Kentucky Derby will offer $3 million in purse money starting in 2019. Churchill Downs officials have cited the success of historical racing games at their Derby City Gaming facility in Louisville as a factor behind the purse increase. The Derby first offered a $1 million purse in 1996; it was doubled to $2 million in 2005. Since the Kentucky Derby is considered the biggest race in the world, millions of people from around the world bet at various live tracks and online sportsbooks. In 2017, a crowd of 158,070 watched Always Dreaming win the Derby, making it the seventh biggest attendance in the history of the racetrack. The track reported a wagering total of $209.2 million from all the sources on all the races on the Kentucky Derby Day program. It was a 9 percent increase compared to the total of $192.6 million in 2016 and an increase of 8 percent over the previous record set in 2015 of $194.3 million. TwinSpires, a platform for betting online and a partner of the Kentucky Derby and the Breeders' Cup, recorded $32.8 million in handle on the Churchill Down races for the Kentucky Derby Day program. This was a 22 percent increase over the preceding year. On the Kentucky Derby race alone, the handle of TwinSpires was $20.1 million, which is a 22 percent rise compared to the prior year. The race often draws celebrities. HM Queen Elizabeth II, on a visit to the United States, joined the racegoers at Churchill Downs in 2007. The 2004 Derby marked the first time that jockeys—as a result of a court order—were allowed to wear corporate advertising logos on their clothing. Norman Adams has been the designer of the Kentucky Derby Logo since 2002. On February 1, 2006, the Louisville-based fast-food company Yum! Brands, Inc. announced a corporate sponsorship deal to call the race "The Kentucky Derby presented by Yum! Brands." In 2018, Woodford Reserve replaced Yum Brands as the presenting sponsor. In addition to the race itself, a number of traditions play a large role in the Derby atmosphere. The mint julep—an iced drink consisting of bourbon, mint, and a sugar syrup—is the traditional beverage of the race. The historic drink can be served in an ice-frosted silver julep cup, but most Churchill Downs patrons sip theirs from souvenir glasses (first offered in 1939 and available in revised form each year since) printed with all previous Derby winners. Also, burgoo, a thick stew of beef, chicken, pork, and vegetables, is a popular Kentucky dish served at the Derby. The infield—a spectator area inside the track—offers general admission prices but little chance of seeing much of the race, particularly prior to the jumbotron installation in 2014. Instead, revelers show up in the infield to party with abandon. By contrast, "Millionaire's Row" refers to the expensive box seats that attract the rich, the famous and the well-connected. Women appear in fine outfits lavishly accessorized with large, elaborate hats. Following the Call to the Post, as the horses are paraded before the grandstands, the University of Louisville Cardinal Marching Band plays Stephen Foster's "My Old Kentucky Home," a tradition which began in 1921. The event attracts spectators from a large area, flying in hundreds of private aircraft to Louisville International Airport. The Derby is frequently referred to as "The Run for the Roses," because a lush blanket of 554 red roses is awarded to the Kentucky Derby winner each year. The tradition originated in 1883 when New York socialite E. Berry Wall presented roses to ladies at a post-Derby party that was attended by Churchill Downs founder and president, Col. M. Lewis Clark. This gesture is believed to have led Clark to the idea of making the rose the race's official flower. However, it was not until 1896 that any recorded account referred to roses being draped on the Derby winner. The Governor of Kentucky awards the garland and the Kentucky Derby Trophy. Pop vocalist Dan Fogelberg composed the song "Run for the Roses" which was released in time for the 1980 running of the race. “Riders Up!” is the traditional command from the Paddock Judge for jockeys to mount their horses in advance of the upcoming race. Since 2012, it was recited by a dignitary or celebrity attendee. 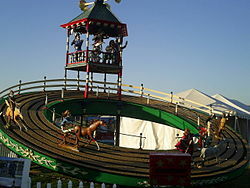 In the weeks preceding the race, numerous activities are held for the Kentucky Derby Festival. Thunder Over Louisville—an airshow and fireworks display—generally begins the festivities in earnest two weeks prior to the Derby. In 2018, Justify became the first horse since Apollo in 1882, to win the Derby without having raced as a two year old. In 2010, Calvin Borel set a new record, being the first jockey to win 3 out of 4 consecutive Kentucky Derbys. designates a Triple Crown Winner. ^ The race was timed to ​1⁄4 second from 1875 to 1905, to ​1⁄5 second from 1906 to 2000, and to 0.01 second since 2001. ^ Dancer's Image, ridden by Bobby Ussery, trained by Lou Cavalaris, Jr., and owned by Peter D. Fuller, finished first, but was disqualified after a post-race urine sample revealed traces of a banned drug in the horse. The drug in question – phenylbutazone – is now legal for use on racehorses in many states, including Kentucky. ^ Apollo (1882) was the only horse to have won the Derby without having raced at age two, until Justify in 2018. "The Kentucky Derby Is Decadent and Depraved", a seminal example of New Journalism by Hunter S. Thompson. ^ a b c Angst, Frank (10 January 2019). "Kentucky Derby Purse Increased to $3 Million". bloodhorse.com. The Bloodhorse. Retrieved 10 January 2019. ^ "Tenth Race Churchill May 1, 2004". May 1, 2004. Daily Racing Forum. Accessed on May 9, 2006. ^ Novak, Claire (September 23, 2013). "Will Take Charge Wins Pennsylvania Derby". Blood Horse. Retrieved February 22, 2014. ^ "The World's Top 100 G1 Races for 3yo's and upwards" (PDF). www.ifhaonline.org. International Federation of Horseracing Authorities. Retrieved March 3, 2015. ^ ^ 2009 The Original Racing Almanac, page 140 for Kentucky Derby, page 156 for the Preakness Stakes, page 241 for Kentucky Oaks, page 167 for Belmont Stakes, page 184 Breeders' Cup, June 26, 2008. ^ "Racing for the Roses – History of Kentucky Derby". February 15, 2014. Retrieved February 22, 2014. ^ "History Of Churchill Downs". Churchill Downs. Archived from the original on March 1, 2014. Retrieved February 23, 2014. ^ McKenzie, Sheena. "Jockey who refused to stay in the kitchen". CNN. Retrieved 2018-02-02. ^ Dandrea, Phil (2010). Sham: Great Was Second Best. Acanthus Publishing. ^ "Horse Racing – Kentucky Derby purse doubled to $2 million". ESPN. Retrieved 2018-04-30. ^ "Record betting reported on 2017 Kentucky Derby". The Courier-Journal. Retrieved 2018-04-04. ^ "How Much Money is Wagered on the Kentucky Derby Each Year?". www.betfirm.com. Retrieved 2018-04-04. ^ Finley, Marty (May 9, 2016). "The 2016 Kentucky Derby: By the numbers". bizjournals.com. Retrieved 2018-04-04. ^ Hopkins, Andrea. "Kentucky Derby, Queen Elizabeth draw festive crowd". U.S. Retrieved 2018-04-30. ^ "Derby jockeys can wear ads". UPI. Retrieved 2018-04-30. ^ Green, Marcus. "Jockey advertising at Kentucky tracks remains rare a decade after ruling". Retrieved 2018-04-30. ^ Isidore, Chris (May 5, 2006). "Kentucky Derby including Yum Brands in its name". Web.archive.org. Archived from the original on May 17, 2006. Retrieved May 10, 2010. ^ "Woodford Reserve is New Kentucky Derby Sponsor". BloodHorse.com. Retrieved 15 April 2018. ^ Sneed, Tierney. "The Origin of Your Favorite Kentucky Derby Traditions". usnews.com. Retrieved 3 July 2016. ^ Fred, Smith (May 1, 1961). "Bluegrass, Bourbon and Burgoo". Sports Illustrated – Vault. Retrieved October 26, 2018. ^ "Giant screen at Churchill Downs gives everyone at Kentucky Derby a front-row view". kentucky. Retrieved 2018-04-30. 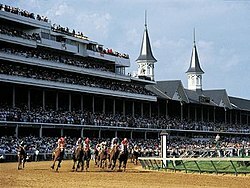 ^ "Panasonic Announces Installation of World's Largest 4K Video Board at Churchill Downs | | Churchill Downs Racetrack | Home of the Kentucky Derby". www.churchilldowns.com. Retrieved 2018-04-30. 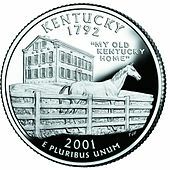 ^ "My Old Kentucky Home". ^ Epstein, Curt (5 May 2015). "Derby, Boxing Match Fuel Atlantic's Best Day Ever". Aviation International News. Retrieved 6 May 2015. ^ "Dan Fogelberg Prodigy Chat transcript Treehouse.org". Retrieved October 16, 2014. ^ Mellisa Hoppert (May 6, 2018). "Justify Wins Kentucky Derby, Conquering Rain, Mud and a 136-Year Curse". The New York Times. Retrieved May 6, 2018. ^ "Super Saver wins the 2010 Kentucky Derby – Kentucky Derby". archive.org. Archived from the original on May 14, 2010. ^ "Kentucky Derby Winners". www.kentuckyderby.com. Retrieved 3 July 2016. ^ Hoppert, Melissa. "Justify Wins Kentucky Derby, Conquering Rain, Mud and a 136-Year Curse". New York Times. Retrieved May 5, 2018. David Domine, Insiders' Guide to Louisville. Guilford, CT: Globe-Pequot Press, 2010. James C. Nicholson, The Kentucky Derby: How the Run for the Roses Became America's Premier Sporting Event. Lexington, KY: University Press of Kentucky, 2012.